It seems there’s always something coming down the food contamination pike. Just as the public begins to forget E. coli in ground beef there’s salmonella in peanut butter. As the salmonella concerns fade, listeria turns up in deli meat. Automated boot washing systems ensure boots are free of soil and are hygienically clean before employees enter processing areas. All are good reasons for the increased focus on sanitation of all types in food and beverage plants. Along with the washdowns, clean-in-place systems and hazards analysis and critical control points (HACCP) programs, there is renewed emphasis on one of the basics of plant sanitation: personal hygiene. 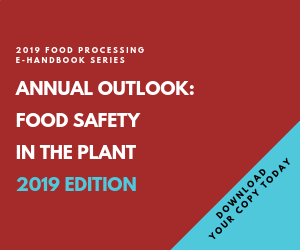 From hand washing to boot scrubbing to clean uniforms, there are simple and largely individual efforts that food plant employees can make to ensure a safe food supply – and the continued success of their plant and their company. Twenty Canadians died this past summer from listeria traced back to a Maple Leaf Foods deli meat plant in Toronto. How the listeria got into two of the plant’s slicing machines may never be fully understood, but spreading it by human contact is certainly a possibility. As of late October, the plant still had not reopened, despite test runs of food. Still, she says, many food plants have not sufficiently addressed the contamination potential of footwear. Simple hand washing is another issue. Hand washing has been a requirement forever. But making sure employees do it and do it right, that’s another issue. Soap: Antimicrobial soaps should be available at all wash stations. Closed dispensers and automatic systems are recommended to prevent the spread of infection. Counters are necessary to track handwash performance. Water: Temperature should be not too hot, not too cold: ideally around 100 degrees, to assist in both pathogen removal and employee comfort. Towels: Single-use paper towels or an automated paper towel dispenser improve cleanliness by adding friction and thoroughly drying hands. Blow dryers have a tendency to leave hands damp, if they are used at all. Sanitizer: Instant hand sanitizers or wipes should be used when handwashing is not immediately available. They should provide residual protection, ideally for several hours, to continue killing pathogens after the wash. Schedules and Guidelines: Handwash guidelines should be established based on health department and/or HACCP recommendations. Time and Convenience: Handwash stations should be conveniently located throughout the facility. In plants, multiple handwashing stations should be installed at the entrance of the plant and in areas to prevent cross contamination. Meritech has a number of hand washing systems, from traditional stations to highly automated – and audited – ones. In the company’s CleanTech systems, employees insert their hands into separate cylinders simultaneously. Twelve seconds in this automated wash yields hands as clean as those that undergo 30 seconds of manual hand washing – if the manual hand washing is done properly. Side-benefits of the system are less use of chemicals and water (75 percent less water) and faster processing of employees. Multiply that 18-second time reduction by a couple hundred workers and the manpower savings add up. “Plus, you know it’s done right,” Colbert emphasizes. Employee hygiene is good at most U.S. food plants, but employees should be trained to realize when they may have inadvertently compromised their hygiene. Meritech also has a walk-through hand and boot wash system, a 6-ft.-long series of automated stations that sanitize hands and boots in nonstop fashion. It can process 25 people a minute. NSF International (formerly the National Sanitation Foundation) has the perspective of seeing best practices in many U.S. food plants … and many overseas. The level of employee hygiene in foreign plants may surprise some American food employees. “I’ve been in Asian plants where it takes 15 minutes to get from the front door to the production floor because of all the safety and hygiene steps,” says Tom Chestnut, vice president of food safety and quality at NSF (www.nsf.org), Ann Arbor, Mich. In addition to jewelry removal, outerwear, hair nets, boots and hats – standards even in American plants – many require full or partial face masks. Often there are several hand wash stations, all monitored by quality assurance employees. There may be hand dip stations – before and after the application of vinyl gloves. “It’s not uncommon to hear a bell or alarm go off hourly, signaling it’s time for all employees to wash their hands again,” Chestnut says. While he’s yet to hear hourly hand-washing bells in U.S. plants, Chestnut admits most domestic food and beverage plants employ a sufficiently high level of personnel hygiene. But that’s no reason to be less vigilant. And there remain some domestic plants that could stand improvement. “Of course, even if a worker goes through all the steps above then slips and stops his fall by touching the floor, all bets are off,” Chestnut continues. Which leads to the most important point: education and training. All parties admit, you can design the best hygiene systems and machines and make all the rules you want, but they’re for naught if employees do not use them properly. And employees must develop a sense of self that helps them recognize if they’ve done anything to compromise their hygiene. And the conscience to immediately rectify the situation. Rather than ask plant managers and supervisors to train and motivate employees in sanitation procedures, many processors turn to experts such as NSF, the American Institute of Baking, Silliker Laboratories or associated product vendors. Uniforms, boots and other supplied articles of clothing provide important safeguards in the HACCP program … but only if they’re handled by the food processor and its employees as carefully as they are by the service that delivers them. Aramark Corp. (www.aramark.com), Burbank, Calif., follows rigorous processes for cleaning garments, as do other uniform services. What concerns Jim Holton, senior national account executive for food processing, is what happens after the uniforms are dropped off at your plant. More companies are requiring employees to change on-site. That ensures no outside problems are brought into the plant. Many plants are getting boot programs to further ensure safety. “Anytime you allow in things from outside the plant, there’s a risk,” Holton says. “Many plants are dedicating locker rooms for uniforms only. No outside clothing allowed. That prevents cross-contamination with other clothing,” says Holton. “We’re also concerned with where our uniforms are stored. That area should be clean, secure and segregated also. “Most of the new food plants are building these safeguards in with fabulous locker rooms and plenty of storage space,” he adds. Holton notes that Aramark representatives do not just pick up and deliver uniforms. Their process is consultative, and they first do a needs analysis with the plant’s food safety experts. That process is repeated quarterly. Employee hygiene goes hand in hand with food safety.